Host Interface: PCI Express 3.0 x8Total Number of Ports: 2Media Type Supported: Optical FiberNetwork Technology: 40GBase-XForm Factor: Plug-in CardDevice Supported: ServerEnvironmentally Friendly: YesEnvironmental Certification: RoHSLimited Warranty: 3 YearThe ATTO FastFrame dual-port NQ42 Optical Ethernet Adapter draws less power than competing solutions while providing faster throughput, meaning users can transfer more data at a lesser cost than the competition, enhancing the Total Cost of Ownership of the NQ42. 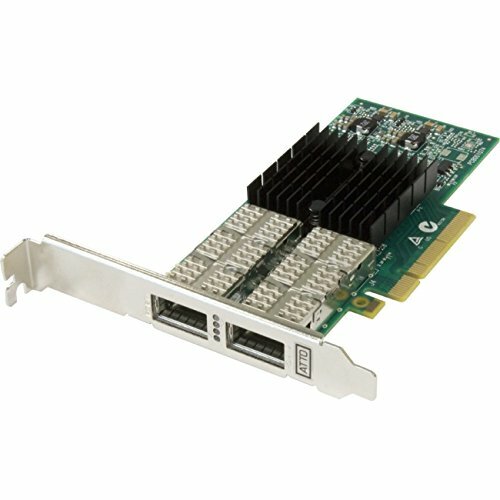 In addition to broad support for Windows™ and Linux server and desktop operating systems, ATTO is a leader in high performance I/O connectivity for Mac OS™ X environments (Mac OSX Driver release TBD). If you have any questions about this product by ATTO Technology, contact us by completing and submitting the form below. If you are looking for a specif part number, please include it with your message.